The Angels rally consisted almost exclusively of singles up the middle. This one is pulled from Juan Rivera’s base hit that made the score 4-1, but I really could have grabbed a screen shot from a number of at-bats. The ball wasn’t hit all that hard, and Betancourt didn’t even get within 10 feet of it. We saw that over and over in the sixth inning. Abreu hit his ball hard, but again, Yuni didn’t really even have a chance to make a play on it as it scooted in to left center field. Abreu is even a LH hitter, so Yuni should have been shifted more up the middle than usual. I don’t know if Yuni was just trying to stand closer to Beltre in an attempt to try to obtain some range by osmosis or what, but he wasn’t playing shortstop in the sixth inning. He was playing some kind of 3B-SS hybrid position that allowed him to gather up anything to Beltre’s left but not have a prayer on balls hit up the middle. So the Angels peppered the ball up the middle, and it led to a loss. Hopefully, the coaching staff will fix this. This wasn’t a lack of range issue. This was a standing in the wrong spot issue. Bruce Hines was standing at 3rd, and (we are told) speaks fluent Spanish. Couldn’t he have moved him? Isn’t this a managerial thing? Is this a chronic issue or just a temporary breakdown? Even when Betancourt looked good in the field, and before the problems with his throwing got really serious, his defensive metrics never matched his reputation. And we’ve seen that the metrics sometimes pull in positioning along with fielding skill, as with Chase Utley covering for Ryan Howard. Is it possible there’s a correlation here? Over the last three years, +/- has Yuni exactly average on plays to his right (towards 3B), -1 on plays right at him, and -30 on plays to his left (towards 2B). So, yes, I think there’s a good chance that Yuni is badly positioned more often than most shortstops. Bruce Hines was standing at 3rd, and (we are told) speaks fluent Spanish. Couldnâ€™t he have moved him? Why would Hines be standing at third when the Mariners are in the field? Although if coaching infielders is Hines’s responsibility (I can’t remember), I’d still expect him to say something. ok, he elbows Dino Ebel out of the coaches box, and yells at Yuni. I noticed the same thing. On the ball he dove for and nearly got (Kendrick’s? ), off the bat it looked almost routine. However, as shown above Yuni is trying to get to balls hit right at Beltre. That was frustrating to see. Great observation. That’s been my suspicion for a while. Explains a lot. Hopefully it is just a carry over from last year’s terrible coaching and the current staff will correct it. Yuni seems to be coachable. I remember thinking the same thing last night during one of the most frustrating innings to watch as a mariner fan. My question to the coaching staff is “With Beltre’s defensive ability, why is Yuni shaded even a hair to his right?” I understand on a heavy right handed pull hitter every now and again but not against the type of guys the Angels had in their line-up last night. As much as we can nitpick Yuni and the rest of the team for being out of position or not taking pitches etc. ; we still have to give them kudos to start the season they way did. Very unexpected and gets us going in the right direction for the rest of the season barring a bad 10-game run somewhere along the line. Let’s see what changes they make and where they go from here. Bring on the Tigers and Go Felix!!! It’s so bizarre, given Beltre’s range. You’d think the team would point out that the team’s basically good for balls hit deep in the hole or towards third base. Only thing I can think of is that he’s not as sure of his arm anymore and wants to be moving towards second on pretty much every throw; like running around a backhand in tennis or something. I do have to say, the ball where he dove and was a bit shaken up (knocked his wind out?) was a combination of terrible positioning and sub-par range. The ball was hit extremely slowly, and a great shortstop makes the play even if he’s starting on the foul line. Wow, I never really paid much attention to a shortstop’s location but this has opened my eyes. I usually am so focused on observing the pitcher and batter. Yuni sure looks guilty of not playing his position. Yea, the positioning really stood out on his belly flop play. You couldn’t tell where he was standing when the ball was hit, but he took about 9 steps and still couldn’t get to a ball that was hit to the SS side of second base. Brutal. This reminds me of Beltre appealing his own check swings. Makes absolutely no sense, and you’d think someone would do something about it. This reminds me of Beltre appealing his own check swings. Makes absolutely no sense, and youâ€™d think someone would do something about it. Except Beltre appealing his own check swings has nothing to do with winning or losing baseball games. Looking at this picture, Lopez may be closer than Yuni, and he’s only covering the bag. 2B usually shades closer to the bag, but I can see Lopez could have had more of a prayer. Looking at this picture, Lopez may be closer than Yuni, and heâ€™s only covering the bag. 2B usually shades closer to the bag, but I can see Lopez could have had more of a prayer. And that’s a bad thing when Lopez has a better shot at a ball hit to the other side of 2nd. And thatâ€™s a bad thing when Lopez has a better shot at a ball hit to the other side of 2nd. That’s often true on hard hit balls. The 2B will often play deeper than the SS because he has shorter throws to make. Aaron Hill in Toronto does this all the time because he plays in shallow RF (though the fast turf infield might have something to do with that). Well, is it possible that Yuni being where he is makes Beltre look better? If Yuni shifted towards the center, a gap would open between him and Beltre. I know hitters don’t have a huge amount of control over this kind of thing, but they have some, and some balls would end up there (randomly or otherwise) and go through for hits if Beltre didn’t shift over to cover that. But then he would have to forgo some of those hits down the line he catches now (to our raves). It’s kind of tempting to blame Ibanez: perhaps Beltre is still suffering a Raul hangover, and wants to makes sure he stops anything that goes up the line because — haunted by the ghosts of leftfielders past — he’s afraid it will rattle around in the corner for extra bases. He knows he has Endy back there now, but he still hasn’t internalized it. (But it is true all those hits by the Angels went for singles; they might not if they had gone up the line all the way to the corner or careened off that bit of the stands that justs out towards the line). Someday when we have Hit FX data we’ll have a much better idea of where to position infielders to compensate for the particular tendencies of the opposing lineup (and we’ll also have a much better sense of how much control hitters actually have over where those hit balls go, and which batters are better at it than others, based on who manages to hit into gaps more often that the numbers predict). But we don’t have to wait for that: in a fantastic article at THT John Walsh looked at the statistical distribution of ~100,000 (non-bunt) ground balls hit during the 2005-2006 seasons, using the raw UZR data, and found distinct “humps” in the distribution on both sides of the infield (radically different humps for different-handed batters, of course). I can’t describe the graphs — you really need to read the article. But comparing them to that picture it looks like Betancourt was standing at roughly 27-29 degrees of arc when, as Dave says, he should be standing at roughly the 34 degree point — or about 9-12 feet to his left, assuming he’s about 10 feet behind the basepath (100*sine(5)) — especially against LH batters. (We had switch hitters and a change in pitchers but I believe the the singles to center were Figgins [L], Napoli [R], Mathews [L], and Rivera [R]). I don’t know which if any of the bits he would’ve got to with that positioning, but at least it would have been closer. In Yuni’s defense, one thing that article also demonstrates is that hits right up the middle are really rather rare. Getting four in a row in that narrow zone has to be really unusual. Though again, I don’t know how much batters can influence that when they see a nice big hole open up. (There are hardly any balls hit just to the right of the 2B bag, and unlike SS-3B, there’s very little overlap between 2B and SS at all). It would be fascinating to do a similar study on last year’s M’s, and to keep track this year once there is enough data. I might give it a shot but I don’t know how to get access to the raw UZR data, but Fangraphs has it so perhaps Dave can get it. This is the same thing I was thinking about while watching the game. I wasnt sure where he was positioned due to camera angles but he definitely was not getting to slow hit balls up the middle and he was nowhere close. The balls hit seemed like they took forever to get to the outfield and that this was incredibly weird. Thanks, Dave. I wondered about that myself. You’d think Wakamatsu and the coaches would have noticed it and adjusted midgame. The last two Mariners I can remember who squandered that much talent were infielders. One was Danny Tartabull, who could have been a great slugging second second baseman, and Rey Quinones, who was a better shortstop than Yuni in every aspect of defense. But they were two of the worst slackers I have ever seen, and Yuni’s work ethic doesn’t appear to be nearly that bad. Well, is it possible that Yuni being where he is makes Beltre look better? If Yuni shifted towards the center, a gap would open between him and Beltre. I know hitters donâ€™t have a huge amount of control over this kind of thing, but they have some, and some balls would end up there (randomly or otherwise) and go through for hits if Beltre didnâ€™t shift over to cover that. But then he would have to forgo some of those hits down the line he catches now (to our raves). I think this is an interesting point. Though if he were not getting to as many balls down the line (5F in the Retrosheet Hit Location Diagram) then he would make more plays to his left side (56, 56S, 6S, and even 6). Right? Though I think the difficult zones (6, 6S, and 5F) end up weighted more because the league average third baseman gets to a fewer number of those, but it would still be trading a zone rating in one difficult zone (his right) for another difficult zone (his left). …he definitely was not getting to slow hit balls up the middle and he was nowhere close. The balls hit seemed like they took forever to get to the outfield and that this was incredibly weird. It seems this happens all the time when I watch. I had just gave up on the idea that Yuni has any agility or range. Wile lack of agility certainly does factor, I never considered he was playing out of position. Thanks BTW Dave for discovering this truth. So, Yuni is the SS equivalent of Jim Edmonds. Everyone used to rave about Edmonds and the balls he would run down. He always had to run so far, and reach for catches because he was out of position a great deal of the time also. …so he’s more like Jeter. You know my dad mentioned something yesterday about that, and i kinda blew him off saying “Nah, he’s just fat and slow.” … good call Dave! â€¦so heâ€™s more like Jeter. I was about to bust out the “Past a diving…” myself. 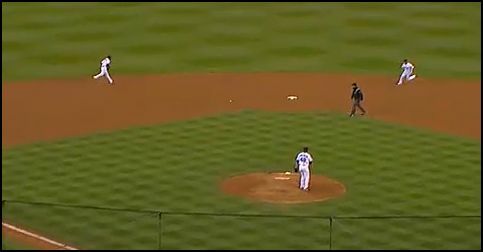 Did anyone else notice that Chavez seemed out of position on the line drive single by Figgins in the 6th inning? It seemed like he was shifted way over towards left field. He did a nice job cutting the ball off and holding him to a single, but it seemed like a ball that should have been caught. Good comments, but I haven’t seen an answer to the basic question that was raised early: isn’t defensive positioning the responsibility of the manager? Even if infielders routinely choose their own positions (e.g. go to double play depth with a man on first, play Ichiro for a bunt, etc. ), managers can override their players’ decisions. If Yuni’s playing in a sub-optimal location, yeah maybe he should be smarter about it but it’s the manager who has to decide who should go where, when to put on a Griffey shift (remember those days? ), etc. Hopefully, the coaching staff will fix this. isnâ€™t defensive positioning the responsibility of the manager? I’d say responsibility is mixed, some goes to the player, some to the manager and coaches, some even belongs to the pitcher. If you recall Washburn’s comments about the spectacular Gutierrez catch in Minnesota, he didn’t expect it because he had wanted Gutierrez positioned in right-center and Casilla hit the ball to the gap in left-center. But I think generally there’s enough discretion allowed that overall it’s appropriate to focus on the guy who’s actually in the field. To elaborate on that, Wakamatsu or Hines or whoever can’t micromanage where everybody stands at all times. If something is wrong, they can give directions, and it looks like they should here. But Betancourt is still going to be deciding where exactly to put himself, and it’s up to him whether he actually changes his approach. Quinones was the one I was thinking of, although in his case it was even worse than Yuni. Rey just didn’t want to play baseball. Tartabull would never have been a second baseman. They should have shifted him on the defensive spectrum before he made it to the majors, but the M’s were pretty lousy back then about making decisions. So when it was clear to one and all that Tartabull would never be a middle infielder, they shifted him overnight to the outfield. With no prior experience. He was brutal out there at first, as I recall. Mike Morse in the outfield brutal. ok, we can only talk about where Yuni stands for so long. this is now a boring thread. Okay, we’ll release control of your computer monitor and allow you to read something more interesting now. Thank you for bringing this up, ’cause it drove me NUTS last night. I had to stop watching for awhile… I literally yelled at the TV “Where the hell is Yuni?” three different times. And a couple of “What the F…?” The Abreu one was pretty much inexcusable. But all three should have at least been touched enough to keep the ball from getting to the outfielder. I definitely blame management for this one– especially when there were also times when the outfield seemed mispositioned… With Endy shaded to left center, and Balentien towards the line, but Ichiro in straightaway right, with a left handed bat up and Johnson calling pitches on the inside of the plate. I can understand positioning players around a fastball pitcher to the off field, but what’s the point if you’re gonna pound the inside of the plate? I questioned that one out loud too. Maybe it’s just the variable of having so many different lineups and pitchers in unfamiliar roles this early in the season? One final thing– Corcoran owes Jakabauskas a steak for that 0-2 letter high fastball out over the plate. Defensive plays made or not made are the things that save runse or allow runs, and help win or lose ball games. Most sportswriters can give foggy generalized speculations based on nothing more than the boxscore. We get enough of that. Dave brought up a very interesting point. Others are following it with more interesting points. Therefore the conversation is interesting to me. Social Dialog 101.
i guess what i meant was that sometimes during the season one comes here to chat about the season more than to read what you write (although we do like what you write, of course), and it would be nice to have a thread where we could chat now about something that isn’t yuni’s d. i guess i could go to baker’s blog but the comments there make the yuni d thread look fun. Each day there’s at least one game or news-of-the-day thread you’re free to discuss random topics within. Shift keys are located on the left and right of your keyboard, by the way. As Dave noted Yuni is average to his right, -1 at him, and -30 to his left. Joser pointed out the THT article that says hits up the middle are not as common. Does this all lead to them shifting Yuni at all? Obviously it would be nice to see him get to balls up the middle. However if its turns him into -15, 0, -20 fielder it seems like letting the less common hits up the middle be the weak area is a good strategy. Assuming the more hits to his right make a quick difference in his range. If Yuni takes 3-4 steps up the middle what do we expect his range to look like? The problem is, he’s still to far to the left of where he should be. Yes, hits up the middle are less common, but he’s not close to the middle. Hits to the left of 2nd are quite common, and he’s not far enough over to get to those. As Dave says, this isn’t an issue of range, it’s positioning. Reminds me of lots of instances where defensive positioning was pivotal. One would think that these guys would learn. BTW, FYI: What are the most popular, the most frequently used Lithuanian family names in this first volume: A-K? From this dictionary, we will list here only those Lithuanian family names which more than 300 families are using. After each family name, we will indicate the number of the families with that name: Adomaitis (726), Adomauskas (382), AleksandraviÄius (408), AntanaviÄius (324), Astrauskas (328), Bagdonas (662), BalÄiÅ«nas (999), BaltruÅ¡aitis. (391), Banys (369), Baranauskas (868), Barauskas (435), Barkauskas (453), Bartkus (369), Bernotas (488), Brazauskas (345), BruÅ¾as (336), Budrys (359), ButkeviÄius (459), Butkus (1021), ÄŒern(i)auskas (651), Dambrauskas (511), Grigas (345), Gudaitis (350), Ivanauskas (747), JakÅ¡tas (313), Jakubauskas (320), JureviÄius (585), JuÅ¡ka (562), JuÅ¡keviÄius (397), Kairys (699), Kaminskas (683), KarpaviÄius (360), Kavaliauskas (781), KazakeviÄius (356), Kazlauskas (1576), Klimas (300), Krasauskas (422), KuÄinskas (529). I made a mistake when I said range. Obviously Yuni won’t get more agility by moving 3-4 steps up the middle. When I said range I ment what do we expect his URZ to look like if he takes a few steps up the middle and corrects his positioning issue. Any educated guesses? My guess? He still thinks Raul is on the team and he’s trying to play LF/SS. He was playing some kind of 3B-SS hybrid … So the Angels peppered the ball up the middle, and it led to a loss. What? They were hitting the ball up the middle because Yuni was in the hole? By that logic, it wouldnt matter where he played, if they can aim their hits based on where the fielders are, they would never lose a single game. Sorry, not even close on that one. Reminds me of lots of instances where defensive positioning was pivotal. Such as the injured Dom Dimaggio frantically (and futilely) trying to wave Leon Culberson more toward left field in the 7th game of the 1946 WS; or Lou Piniellas’s out-of-position catch on Fred Lynn in that playoff game.